The Raiders main concern this draft was to get speed in their secondary and they are hoping that the young talent picked in this draft would make an impact right away. In 2010, the Raiders secondary gived up way to many deep yards and points. 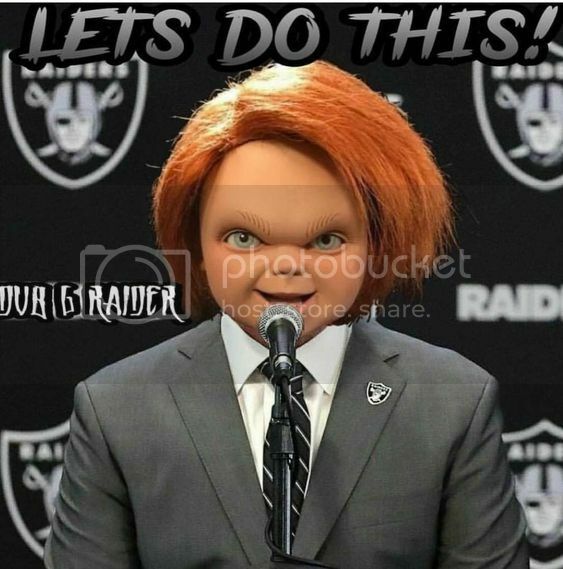 The Raiders had a good training camp so we are hoping that the three young rookies, CB Harris, Goodrich and FS Jones can get into a good start. Also, the Raiders worked hard with QB Adrew Luck, although he was 2nd in the league in yards, he lead the league in interceptions. It will be a challenge for him to bring those int's down this season. The Raiders are confident in his abilities and as Luck sees it, it was a learning experience for him which has allowed him to work extra hard in the offseason. The Raiders will also have to improve in their defensive line and on their offensive line as they hope to have LeSean McCoy contribute more this season. Also, the offensive line will have their work cut out for them as they come up with new schemes in protecting the quaterback. QB Luck will need to stay consistent and hit those speedy WR's and allow for a more wide open plays. Overall the Raiders are looking to be a contender this season so we're anxious to get this season started!! The Raiders secondary struggled in week 1 against the Chargers allowing Phillip Rivers to throw for 381 yards. Also taking advantage of the Raiders weak secondary was Chargers WR Charles Burke as he caught a total of 7 catches for 266 yards, 2 TD's. Another area of concern for the Raiders is the defensive line, not able to stop the run effectively. The offensive line did enough to get through day. The bright side is that the Raiders are please with Rookie QB Andrew Luck. He threw for 240 yds/1 TD and although he got sacked 3 times, Raiders know he will just improve as the season goes on. Also the Raiders look into getting newly acquired HB Lesean McCoy more involved in the game. Raiders feel and can be another weapon to their quick reciever core. The Raiders picked wisely this draft in the attempt of building a competitive team despite of letting go some key players. It was tough trading McFadden to the Eagles but feel it was good in getting HB McCoy and RE Darryl Tapp in return. Raiders were desperately in need of a QB and were worried that QB Andrew Luck would be picked early in the draft so we were excited that he was available. Raiders hope to develope Luck to an elite QB and are anxious to get him started. Raiders also picked RT Mike Adams, he stood out from the rest of the RT's and has the potential of becoming a dominant offensive linemen. Raiders expect a good training camp for him. In a move to free up some cap space, the Raiders are looking to trade HB Darren McFadden. Raiders looking to get 1st round pick and or package deal. After the Raiders loss to the Chiefs, we could not find Coach Angel for her usual press conference. Instead, there was a small DVD and we were told by the press to insert it into the player and that she would take questions after next week's game. A lot of WR's had a long look by Raiders scouts and with that being a need, we had seen the intangibles that Mickens possessed. Along with familiarity with playing with fellow college alum Darrius Heyward-Bey, he had the smarts, the speed and the agility to make the cuts necessary to improve this Raiders receiving corps. His get up and go will need some work but with some practice in training camp, we feel that he will be an instant starter and work with one of the best in Bernard Berrian.